When we first started working on the Adarna series in 2014, we were itching to re-imagine the world penned by Jose de la Cruz. 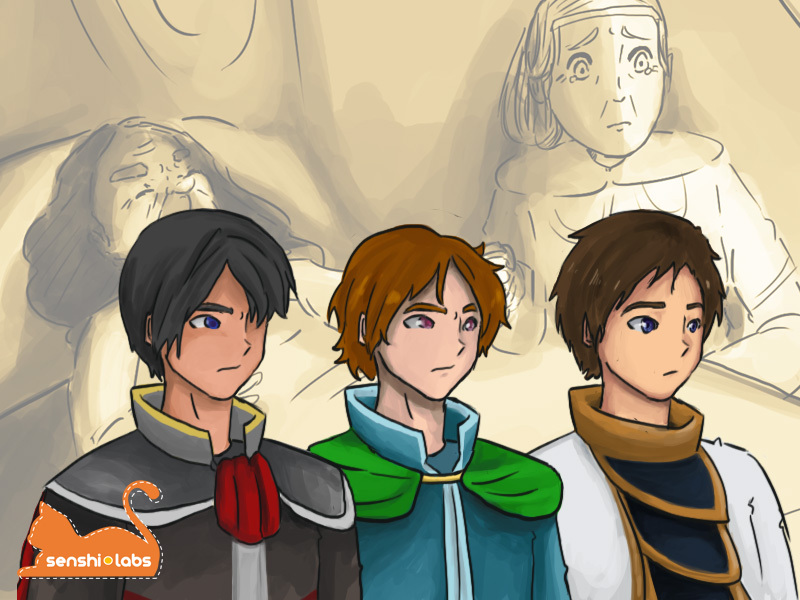 The first part of the corrido was set in the fictional Kingdom of Berbanya, where Prince Juan sets off to find not only the cure for his ailing father but also his missing brothers. After Juan rescues his brothers, sane readers might realize how dysfunctional the royal family is. Juan’s older brothers, Pedro and Diego, were so inexplicably evil that questions could be raised as to the values being imparted by this high school reading requirement. So we proceeded to re-write their story by way of Adarna, the first of the series, which was released in 2015. We tweaked the older brothers’ personalities. Diego’s personality was reworked to portray the image of a smart brother, a mediator of sorts. We also worked to give Pedro a motive that better explains his personality. Juan retains his simplicity and soft-hearted nature. This way, the three brothers are given a stronger dynamic and provide the story with a more diverse set of personalities beyond just good and evil. We wanted to impart family values and brotherhood bond (while helping all of us be more comfortable with Tagalog). “Good” and “evil” just does not cut it. Our re-imagining of this colorful world did not end after Adarna’s release, especially since a few players wanted us to introduce Juan’s girlfriends: Juana, Leonora, and Maria Blanca. Upon re-reading this section of the corrido, however, the team thought, “Hey, you can summarize the second adventure as a bride shopping spree, but he eventually hands over his rejected girlfriends to his older brothers!” Guided by the fact that this is required reading in high school, we decided to come up with a sequel that focuses on the girls themselves instead of the tragic love affairs they had with Prince Juan. And so we began working on Adarna: Alamat ni Maria Blanca. Detroit Tañeca, the game’s overall designer (level designer, programmer, assistant writer, sometimes fill-in artist) had his work cut out for him when he had to build, destroy, and rebuild this world to properly convey our message. We decided to go with a pre-Hispanic look when re-writing Reinos de los Kristales (The Kingdom of Crystals), where Princess Maria Blanca lived. Adarna 1’s Berbanya was largely influenced by European styles, and it exuded a patriarchal, old world society. Pre-Hispanic Philippines, on the other hand, had many matriarchal societies. We thought it would be better to take a few pages off of ancient tribal customs for the re-write we had in mind. Some of us even went on personal trips to various parts of the Philippines to look up ancient weaponry and fighting styles. Even if not all our findings were put to use in-game, we have gathered enough material that allowed us to create stark contrast between Kristales and Berbanya, as you can see below. 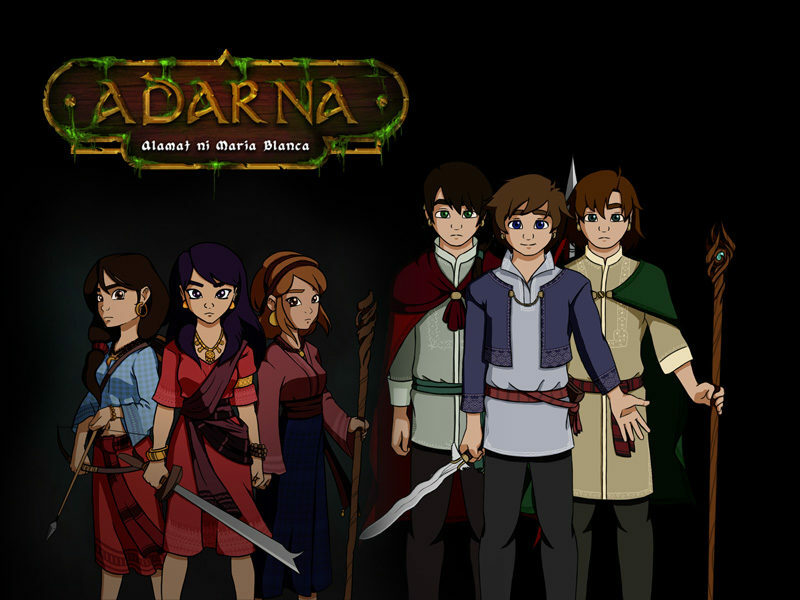 Left: Adarna with its Western look. Right: Adarna: Alamat ni Maria Blanca’s tribal Philippines look. 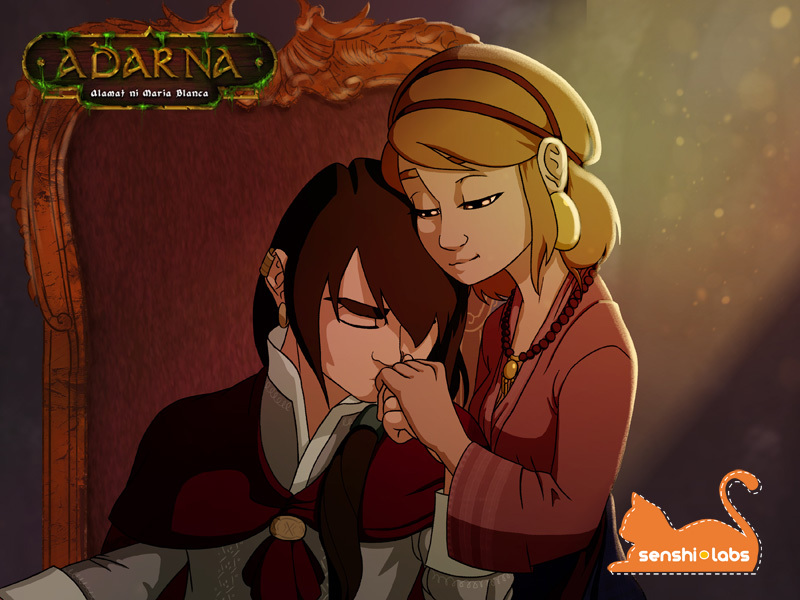 The transition to Adarna 2 also saw a major art style change. Conserving our resources upon seeing that we only had one pixel artist (who also happens to be working on Book 2 of the War Guardian Chronicles), we decided to ditch pixel art altogether. While Adarna 1 had a combination of painted and comic book scenes by Eunice Gatdula (we wanted a children’s storybook kind of feel at that time) and pixel sprites by Inquisitor, we had to trust Kimberley Warne to lead the art direction for this one. With the “kimmified” look, all the supporting artists seemed to have nailed the atmosphere we were gunning for. With Adarna 2, we finally had a complete art team and eliminated the need to borrow pre-made art from asset packs. To enhance the change in art style, Nhyne Junio composed a complete soundtrack that embraces the feel of nature, as the protagonists are so attuned to it. The other directive? “Make it sound Filipino. Something that’s earthy, malambing yet strong at the same time,” which we think he nailed.” You can listen to all the music tracks here. 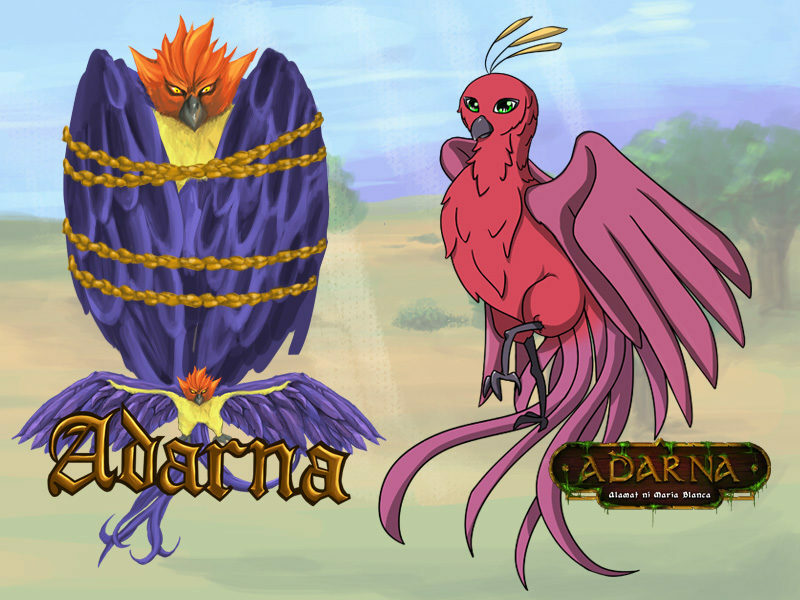 Those who have played both versions might also notice a change in the gender and demeanor of the Adarna bird itself. Eunice’s badass bird in Adarna 1 represents the masculinity and courage of the group it was supporting. Jammy Rodriguez’s elegant creature in the sequel represents the femininity and strength of the second group. While we wanted to depict parts of our ancient matriarchal societies, we also wanted to make it clear that the men in those times were not weak. And while the NPC dialogues reflected certain customs regarding men serving the families of the women they wanted to court (men in those days paid dowry as well), Reinos de los Kristales was ruled by a strong and wise king. The princes of Berbanya had, of course, led very sheltered lives. They had only sharpened their battle skills through their adventures in the first part of the story, but they could only grow stronger in the sequel. By stronger, we do not mean only physical strength. Juan, for instance, is not as smart as Diego or strapping as Pedro, but Juan is kinder, more forgiving, and nurturing. 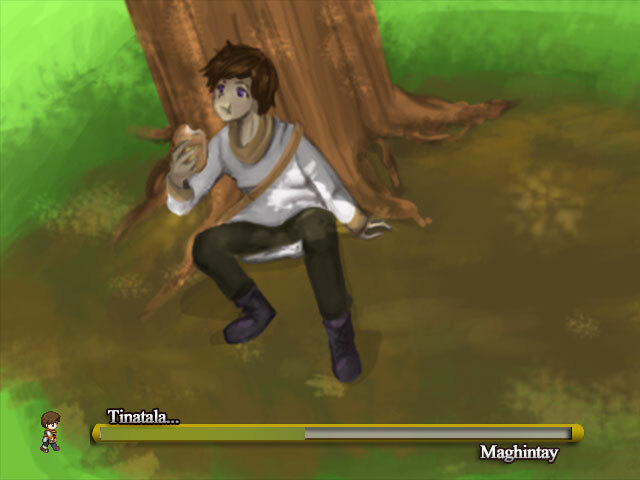 His personality is quite in contrast with the sequel’s protagonist, Maria Blanca. While all women in this game have compassionate hearts, Maria has the more dominant personality because she came from a kingdom of renowned warriors. Juana, from the minor kingdom of Kweba Unido, is the overprotective younger sister to the gentle Leonor. We retained the pairings from the original manuscript. The major plot points we removed are those parts involving Juan and his bride hopping. Depicted in one of the cut scenes below: forceful Pedro is tapered by Leonor’s tenderness. We retained the Philippine mythological monsters from Adarna 1 except for the art. To keep things consistent, Emman Briones was the only artist who did the monsters for Adarna 2. 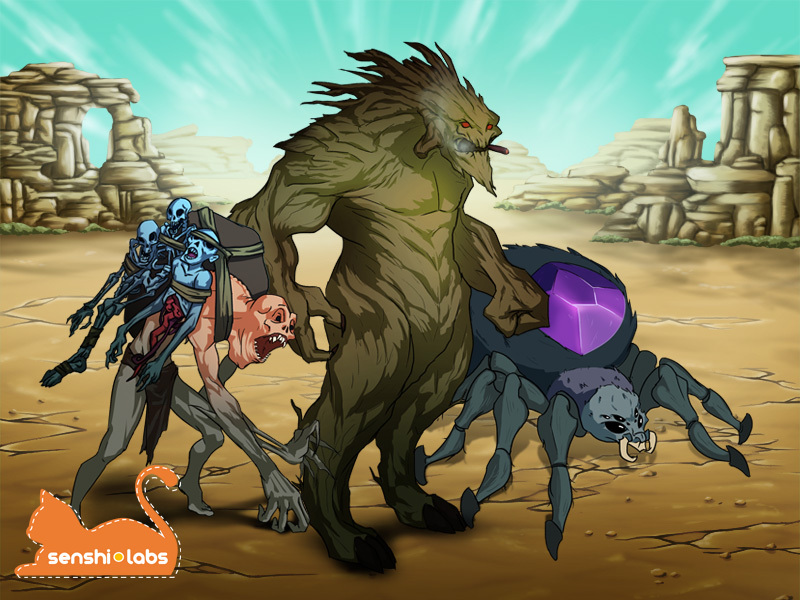 Pictured below: the balbal, kapre, and malignong gagamba with Andrei Ferrer’s wasteland background. We had to be more conscious about our quest designs this time around, though. We noticed that some of the quests in Adarna 1 seemed to encourage animal cruelty (collect 10 lion claws to make a necklace or something of that sort). In Adarna 2, the characters killed monsters for meat or if the monsters are being especially destructive to humans and other monsters. We also concentrated on quests that involved helping townsfolk with their problems even when your characters don’t want anything in return. It’s actually hard to believe that we’re done creating the game. We had our fair share of fun times and desperate moments (just how many times did Detroit have to redo entire maps from scratch, and how many times did Nhyne get asked to revise music tracks? ), but we’re quite happy with the results and we’re hoping many of you would enjoy this game as much as we enjoyed making it. Share the post "Re-Writing Berbanya and Kristales"
Doc B is a crazy cat lady who happens to be an indie game producer and has been a web author since 1997. She started her career in the video game industry in 2004, as a writer and gameplay specialist for Level Up, Inc. (Ragnarok Online). Her last dev studio, before building Senshi.Labs, was Anino Games, Inc. (Grave Mania). Her vocation is teaching, so she is a part-time Full Professor at De La Salle-College of Saint Benilde and at Asia Pacific College. Her portfolio can be found at http://docb.me.